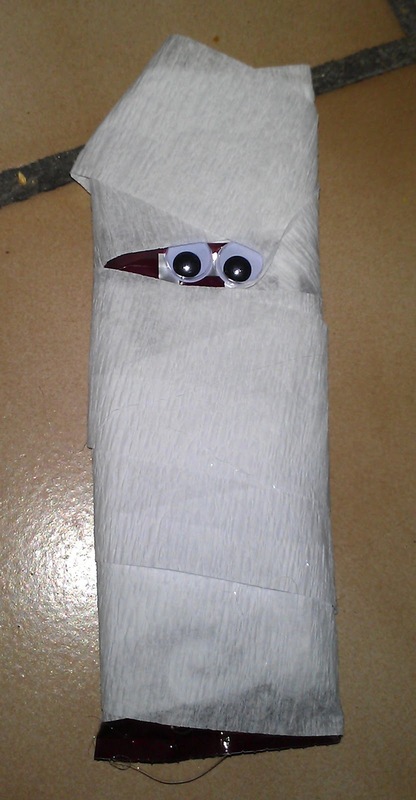 At my school, all of the teachers exchange names and have a secret pal for the duration of the school year. Once a month, we are supposed to sneak a little gift to our pal, which is not to cost more than $5. It's kind-of a cool little system, because at the beginning of the year we all fill out a brief questionnaire asking about some of our favorite things. My secret pal listed that Halloween was one of her favorite holidays, so, as it's October, I put together a Halloween-themed goodie basket. It looks much larger in the picture than it is. I got a bowl at the dollar store that is about the size of a large cereal bowl. It has little candy corns on it, so it made a cute base and hopefully my pal can use it again. 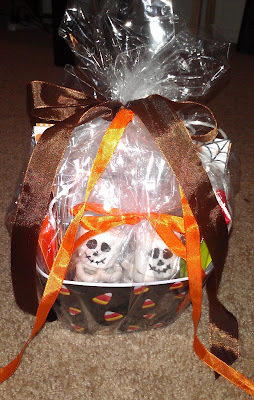 I filled the bowl with Halloween goodies that I put together, combining several ideas I have found on Pinterest. You will also need a black edible marker. I found this one, made by Wilton, at Michael's in the Halloween section. You just use it like a magic marker. 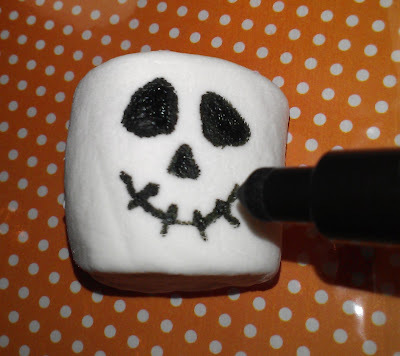 Start by drawing a little skull face on a big marshmallow. 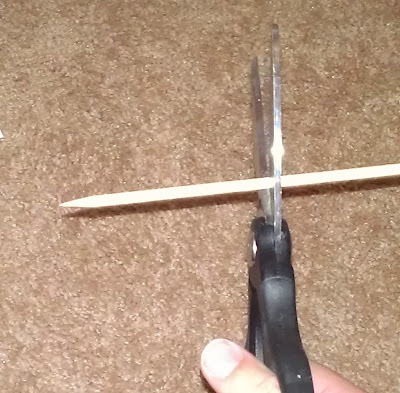 Next, take one of the bamboo skewers and cut it to about 3-4" long. Insert the pointy end of the skewer into the center of the brownie base. 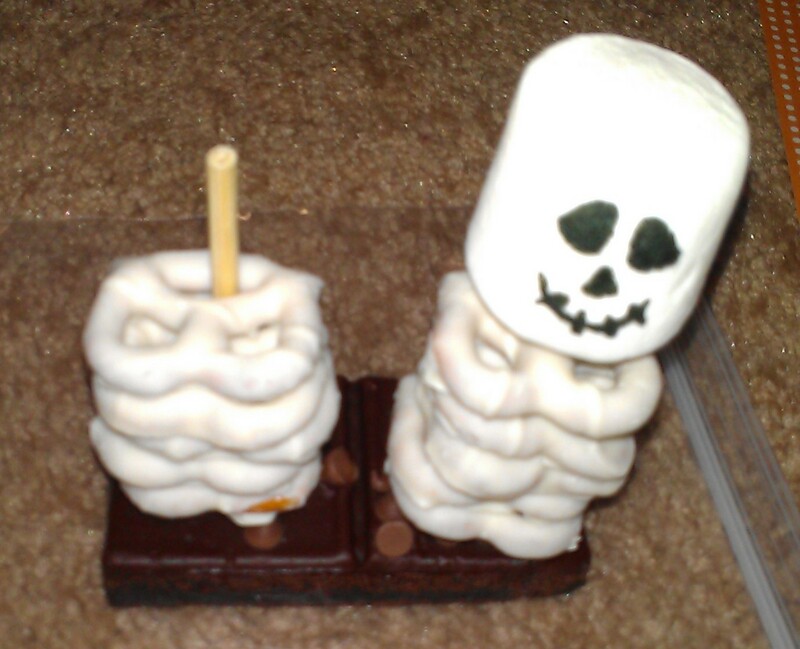 Since the Little Debbie brownies are doubled, I just put two skeletons together on the same brownie. They're like a cute little skeletal couple. Take about 5 white chocolate pretzels and thread them onto the skewer. Finally, place the marshmallow on top of the skewer, and you have a Pretzel Skeleton! I wrapped my cute couple in clear cellophane and tied an orange ribbon around the top. 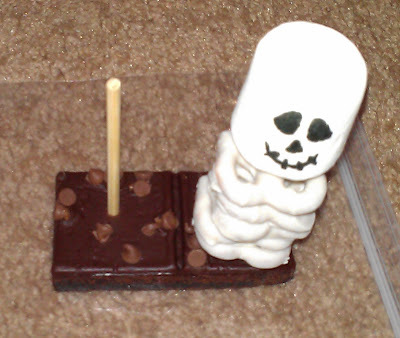 While I was not having a problem with the skeletons staying upright, the brownie base was a little shallow, so I was concerned about them getting a little loose during transport. The cellophane seemed to really help keep them in place. Plus it looks fancy. Let me tell you, I had a heck of a time trying to find those ghost Peeps. The original blog where I found this idea said they could be found at Target, but my Target did not carry them. Neither did Kroger. Finally, I went to the Peeps website and clicked on store locator. I found out that Walgreens was the only store in my area that carried them. So if you want to make these yourself, save yourself the hassle and find out what stores in your area carry them before you go hunting all over town; or, better yet, order them from Amazon. 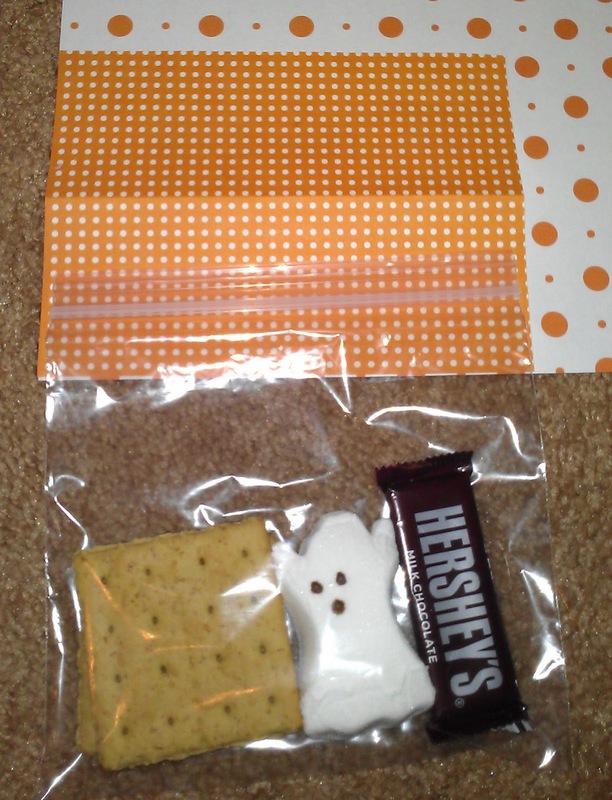 I put two graham cracker squares, one Hershey bar, and one ghost into a sandwich bag. Then I took some decorative paper and cut it the width of the bag by about 4 inches to make a label. I played around with some lettering and drew the labels by hand. I was only putting together a couple of kits; if you were making a lot of these I would suggest printing out a label to save time. 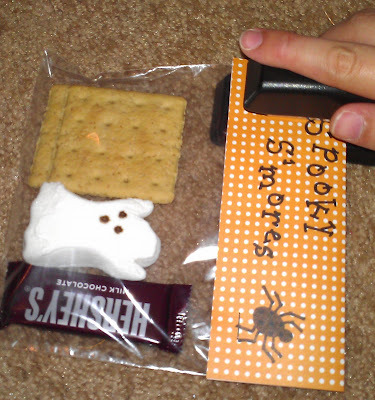 Then I stapled the labels onto the sandwich bags. Ta-da! Completed Spooky S'mores kit! These are just too fun! I think it would be cool to make these for a family, with one bag for each person. 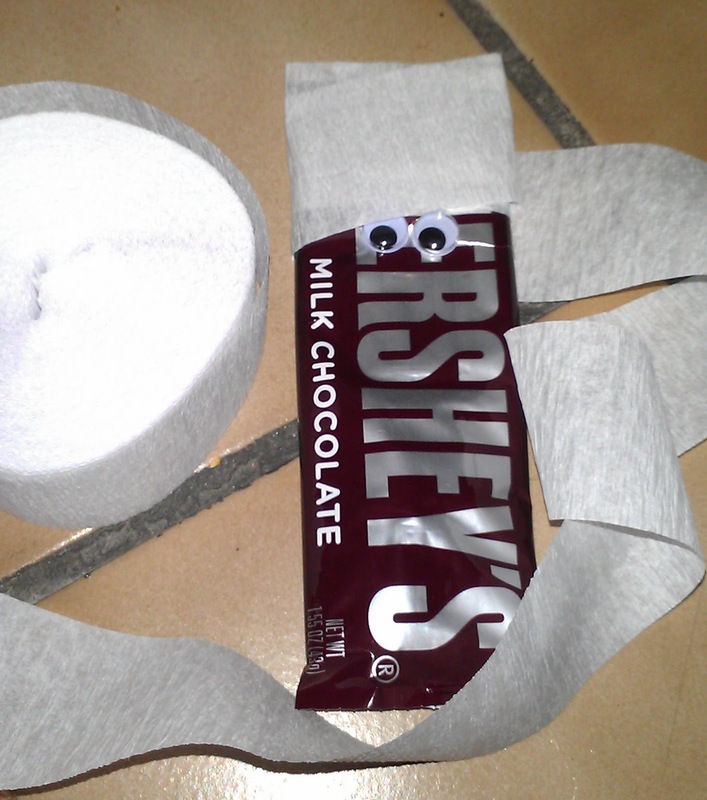 I started by gluing the googly eyes onto the candy bar. Then I wrapped the bar in the crepe paper, using the glue gun to tack it on the back every two or three wraps. (Ignore the odd shape of my chocolate bar. It apparently got a little too hot in the car. Yes, it's still warm here, October or not. 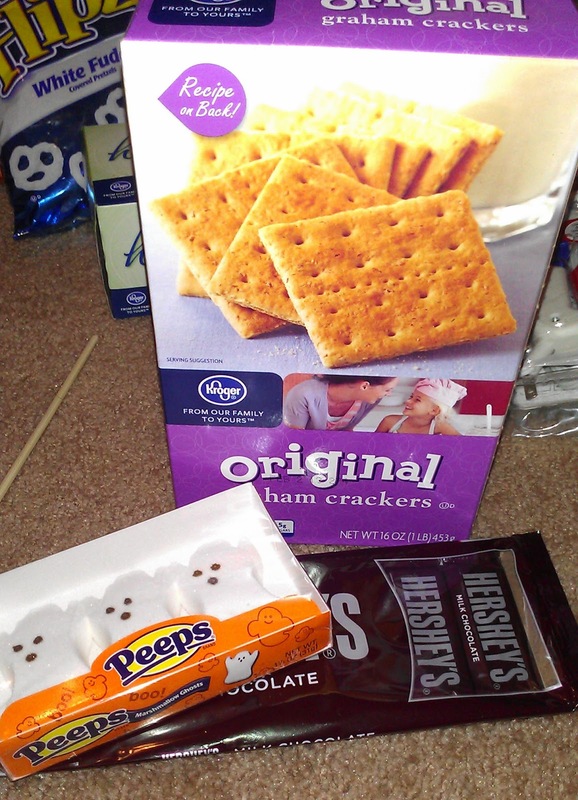 Fortunately you can't tell the chocolate is oddly shaped once it's all wrapped). This little guy just makes me laugh. 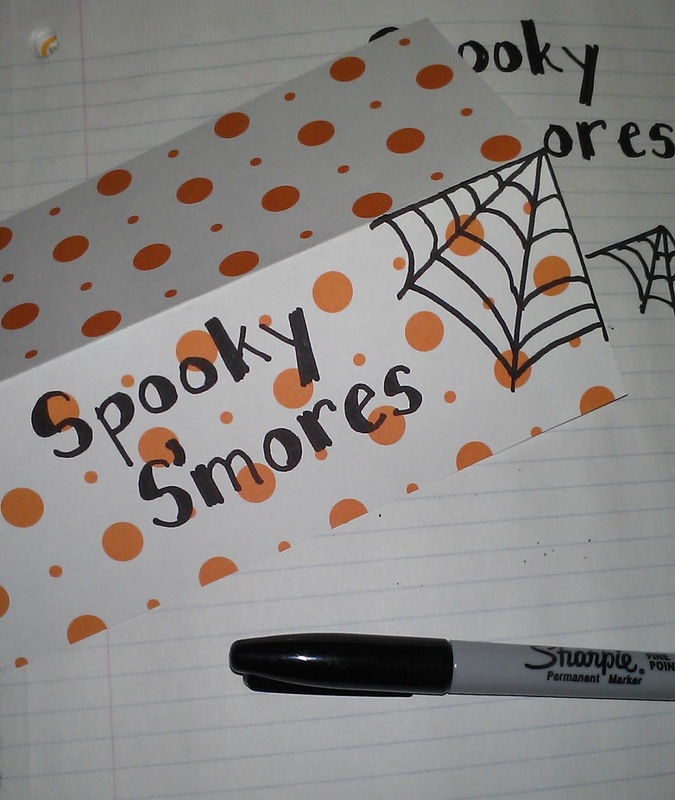 They were just the perfect size to slip a fun-sized candy bar into, so that's what I did. Once I piled everything into the bowl, I wrapped the whole thing with cellophane and tied a ribbon around it. I love how the skeletal couple are peeking out. So cute. I also made a gift tag out of some scraps of the decorative paper and tied it on, but do not have a picture of it because you can see the recipient's name too clearly. You know, anonymity and all that. 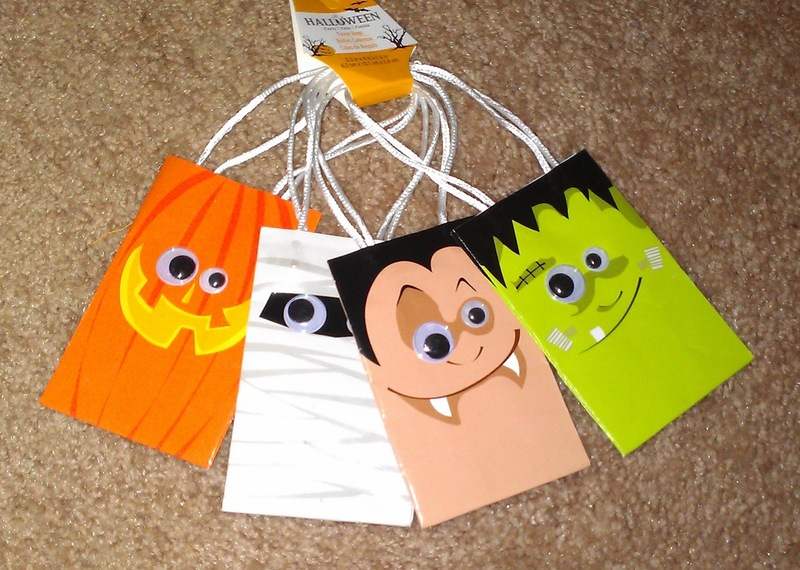 Any of these little projects would be fun to do with kids and give out to friends. I hope you all enjoy!